To play this game, just click the "start game" button below. Select playing cards to reveal cereal boxes. See how long it takes you to match them all. Good luck! 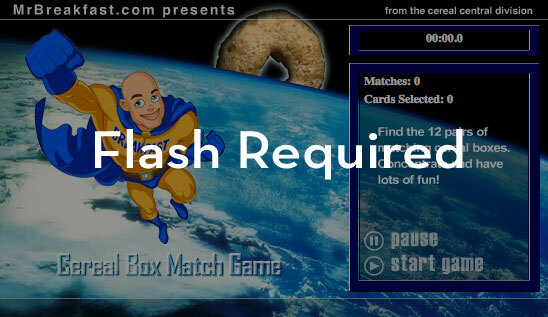 Mobile Users Please Note: A desktop or laptop computer is required to play this SUPER FUN game as the functionality is reliant in part on Flash which is not available on most mobile devices. For more information on the cereals shown in this game, check out the following pages at The Cereal Project on Mr Breakfast.com. If you liked this game, you're gonna love Breakfast Cereal Hangman. Try it now!